It’s National Moth Week! Right now (July 23rd – 31st)! Celebrating the 90% of the order Lepidoptera (“scaled wings”) that are not butterflies! Moths are diverse, successful, showy, drab, cryptic, abundant, huge (a few have wingspreads close to 12”), micro, tasty, toxic objects of our admiration, confusion, superstition and reverence. A Nature Center near you may be hosting moth-related activities; meanwhile, check out the National Moth Week website. And, as the folks at The Nature Conservancy say, “Don’t just sit there, do mothing!” Here is some of the local talent. 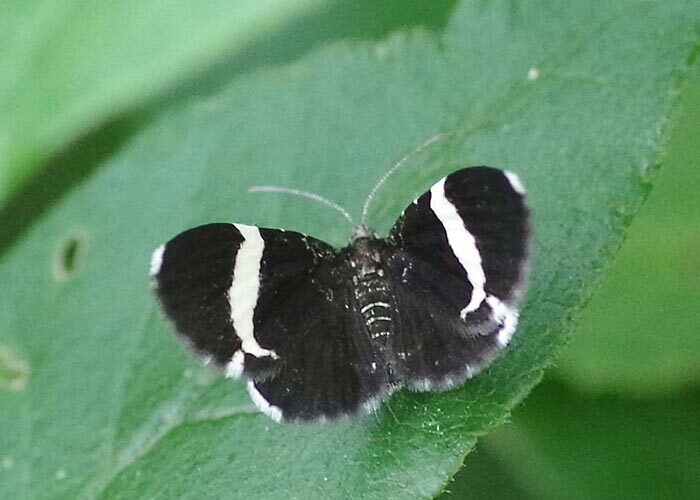 What else could you possibly name it but the White-Striped Black Moth (Trichodezia albovittata)? 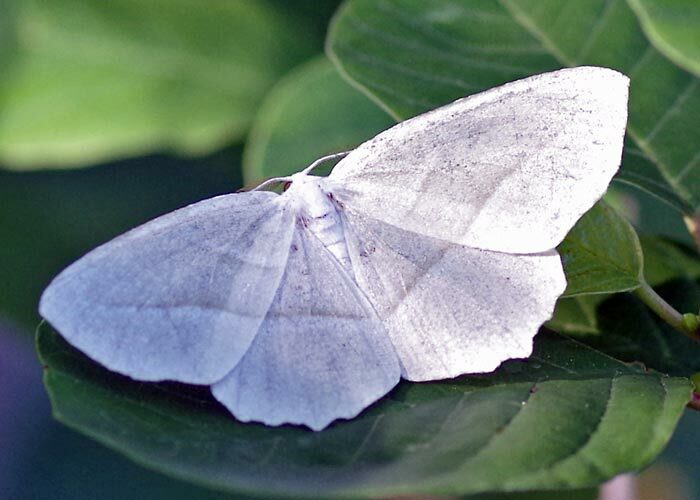 It’s in the moth family Geometridae, whose caterpillars are the “earth-measuring” inchworms, and it’s found over the northern two-thirds of North America. The BugLady usually sees this beauty around wetlands. Why? Because its caterpillars (http://bugguide.net/node/view/1192235/bgimage) eat Jewelweed (a.k.a. Impatiens and Touch-me-not). Caterpillars feed at night and remain motionless on a damaged leaf during the day. 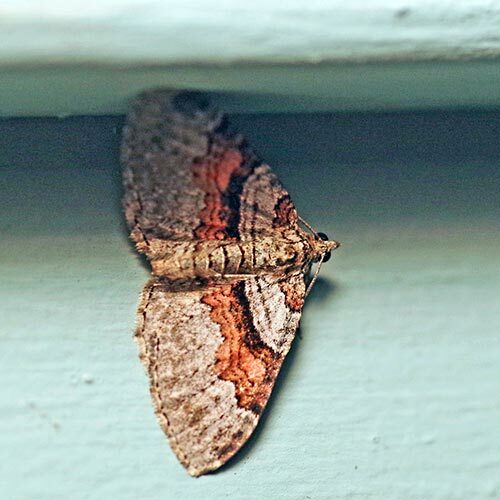 Geometrids have paired “tympanal organs” (ears) at the base of the abdomen—most are nocturnal, and the ears let them hear communiques from other moths and the squeaks of bats. Though the day-flying White-striped black moth doesn’t encounter bats and it doesn’t produce sound, its vestigial ears allow it to hear ultrasound anyway. There are two generations per year. 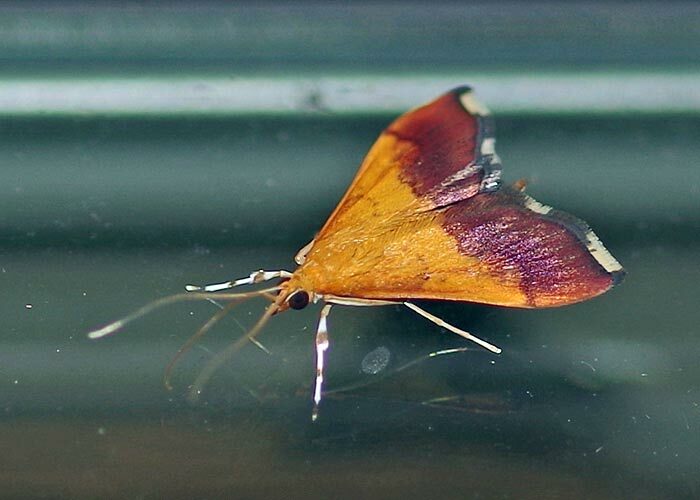 The BugLady encountered the fingernail-sized Bicolored Pyrausta (Pyrausta bicoloralis) (another well-named moth) in a wetland in mid-June in daylight, and more recently added it to her list of “porch light bugs.” It’s in the family Crambidae (Crambid snout moths), and it can be found in the eastern half of North America, and south into South America. Bugguide.net notes that the life cycle of this widely-distributed species is “unknown,” including the caterpillar host plant(s) (which means—no caterpillar pictures) but mentions that the genus name Pyrausta comes from the Greek naturalist Pliny and means “a winged insect that was supposed to live in fire.” And—hmmmm—it seems like the moth on the BugLady’s not-very-clean window may be finding something to eat there. 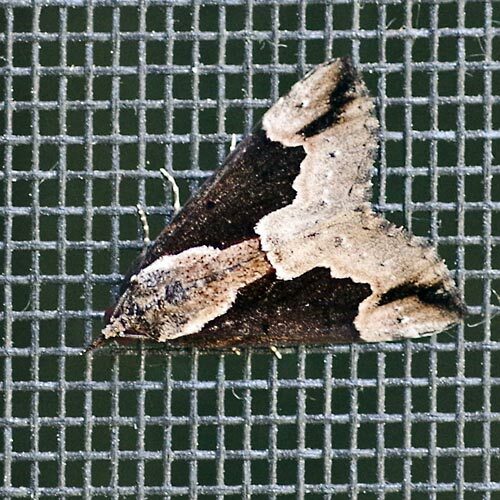 The Baltimore Snout (Hypena baltimoralis), in the family Erebidae, has several aliases—it’s also called the Baltimore Hypena, and when it was in the genus Bomolocha, it was called the Baltimore Bomolocha. 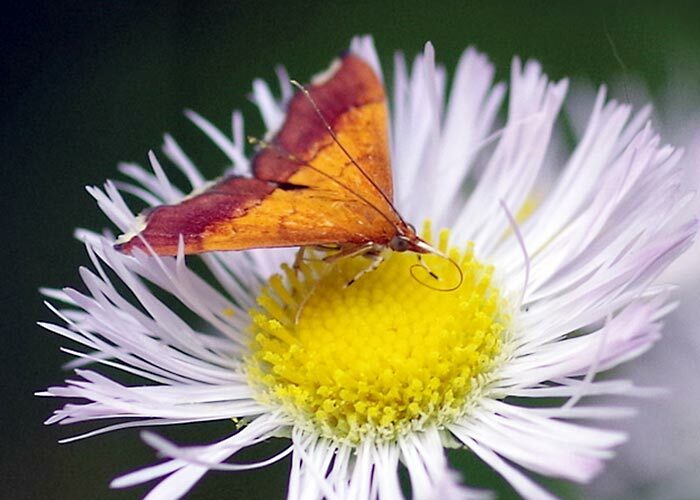 This common moth is found in damp woods and edges east of the Great Plains; there, its caterpillars feed on maples leaves, especially those of red and silver maple (http://bugguide.net/node/view/932614/bgimage). There are two generations here annually, and more to the south. The Baltimore Snout is sexually dimorphic (not something the Supreme Court needs to rule on, that just means that there are differences between males and females—in this case, in coloration—the wings of females have a whitish sheen). There’s some variation in pattern and color (http://mothphotographersgroup.msstate.edu/species.php?hodges=8442). The Labrador Carpet (Xanthorhoe labradorensis) is another Geometrid. Its range is listed as Alaska to Newfoundland, south as far as Louisiana and Mississippi, but with very few exceptions, the pictures submitted to bugguide.net came from Canada and the northern tier of states. The caterpillars feed on a variety of different plants, both woody and herbaceous. There’s a single generation per year, and they probably overwinter as pupae. The False/Hairy-Legged Wainscot (Leucania pseudargyria) is in the Owlet moth family Noctuidae (the BugLady thinks that this is the False Wainscot rather than the almost-as-fuzzy Ursula Wainscot). It lives from Manitoba to the Maritimes and south to the southern Appalachians; its habitat includes grasslands, wetlands, and woodlands, and its caterpillars munch on a variety of grasses, both wild and domestic. There’s a single generation per year; the wainscot overwinters as an almost-mature caterpillar and pupates in the spring. The Pale Beauty Moth (Campaea perlata) (perlata meaning pearly in Latin) is a Geometrid whose caterpillar (http://bugguide.net/node/view/986140/bgimage) has its own name, the Fringed looper (the BugLady is tickled by those caterpillars whose ventral fringes allow them to melt into twigs). They’re found in woodlands and shrublands from Alaska to Nova Scotia to North Carolina to central California. 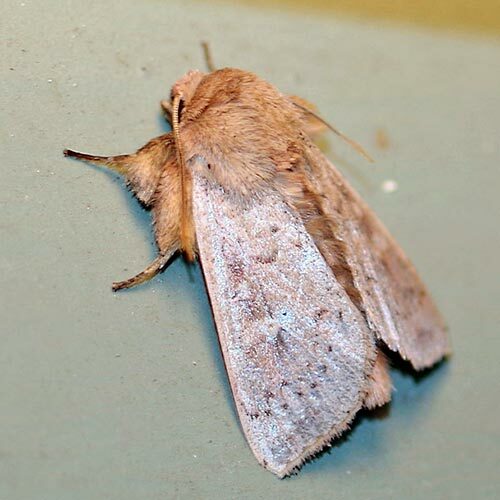 Males and females look alike, except that females are much larger (more sexual dimorphism), and the adults range in color from pearly white through pale yellow to light green (http://mothphotographersgroup.msstate.edu/species.php?hodges=6796). Sogaard, in Moths and Caterpillars of the North Woods, says that ”The pale green adults tend to perch pressed against the undersides of living leaves, where they are largely invisible, sheltered from direct sun and rain, and more energetically costly for birds to hunt.” Caterpillars are generalist feeders on lots of woody plants from alder and to willow. There’s one generation per year in the north, and the caterpillars seem to tough out the winter, exposed, on the bark of trees (Party on, nuthatches) and pupate in spring (http://www.buglifecycle.com/?page_id=3334). Go outside. Turn on the porch light. Find some moths.